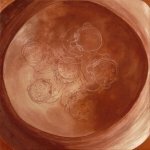 Original art on canvas by painter Jan Karpíšek "In the Kettle" is a view inside the copper kettle on its bottom several beings stand around a little kettle while their heads are small kettles as well. The kettles around a kettle in the kettle refers to the fact of impermanence of the physical plain where "heating" is our future. Details made in the glossy metallic color mean the holy Fire.